For reasons of data security, please do not use this form to send confidential or sensitive information to Economic Development Muttenz; send this by post or by fax only. Economic Development Muttenz will contact you at the earliest opportunity. For many years, Muttenz has maintained an excellent infrastructure comprising a wide range of social, cultural, sporting and leisure facilities. Thanks to the efficient tram, bus and rail connections, the considerable cultural attractions of the city of Basel are just minutes away. The commercial sector of Muttenz is highly diverse, with numerous trading and service companies and renowned industrial enterprises, some of which are global players. To a large extent, the interests of the business community are represented by the Association of Trade, Commerce and Industry, which has around 230 members. Association of Trade, Commerce and Industry "KMU Muttenz"
The municipality of Muttenz provides education at every level, from kindergarten and grammar school to the GIBM technical college and the University of Applied Sciences Northwestern Switzerland with its schools of Architecture, Civil Engineering and Geomatics and Life Sciences and Technology. Coordinates: 47°31' north 7°39' east. Muttenz is situated east of Basel at the base of the Wartenberg; the town has a surface area of 16.6 square kilometres and a population of around 17,000. Industrial, commercial and trading companies of all sizes provide jobs for over 14,000 people, half of whom live in Muttenz. 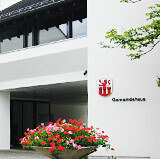 This makes Muttenz the municipality with the largest number of jobs in the canton of Baselland. The people of Muttenz are served by around 140 administrative officers. The staff of the general administration and construction planning office are available to offer advice by telephone from Monday to Friday 8 – 11.45am noon and 1.45–5 pm; the public counter at Kirchplatz 3 is open from 9–11 am and 2–4 pm (until 6.30 pm on Wednesdays). The political life of Muttenz is influenced by numerous political parties. Political decisions are taken by the municipal assembly in time-honoured democratic fashion. Are you looking for the right location for your operation in Muttenz? Do you have an interesting proposal to make? In partnership with the Basellandschaftliche Kantonalbank, the municipality can help you find the right property in Muttenz. 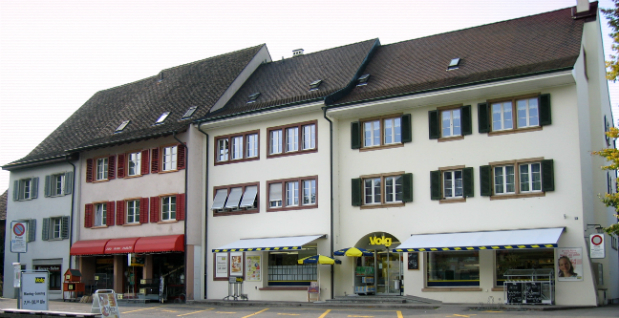 For more real estate offers, houses and appartments please visit on internet pages like www.alle-immobilien.ch, www.homegate, www.immoscout24.ch, www.UrbanHome.ch... and others.